Marion Pindsdorf's prescription to prevent a corporate disaster is: "when public health and safety are involved, tell it all and tell is fast." 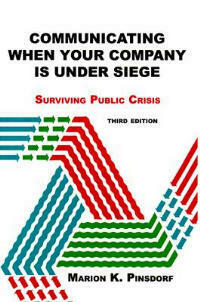 This book is a guide for companies large and small for surviving a public crisis. It is a battle tested guide written by a veteran public relations expert that is packed with information on working with the media during a corporate public crisis. Pindsdorf uses specific cases as examples of how to and how not to handle public relations during a crisis.